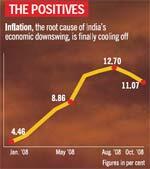 The economic slowdown has already impaired both performance and sentiments. But would things take a turn for the worse before they become better? We sift through key domestic economic indicators to analyse what’s in store. From bankruptcies, collapse and bailouts, the words defining economic crisis have changed a bit. Layoffs, cost-cutting, right sizing, cash conservation are the new defining terms. Yet, as the clouds hanging over the economy get darker and darker, the question uppermost on everybody’s mind isn’t how bad things really are, but how bad will things get. Have we seen the worst or is the worst yet to come? To be sure, a definitive answer is impossible at this stage. But a few key economic indicators and global developments do point to the shape of things to come. Major global economies like Japan and Germany have already slipped into a recession, and the largest of them all, the US, seems to be headed into one. To India’s north, export powerhouse China has announced a $586-billion plan to combat the slowdown. India hasn’t felt the need for a bailout, but GDP growth has already tapered off to just under 7 per cent from the heady 9 per cent plus levels. From New Delhi to Darjeeling, India shining is now India slowing. More ominous than the speed of slowdown is its spread. That’s one indicator of how the sectors. 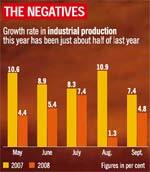 Index of industrial production for the month of August grew by just 1.3 per cent. Worse, from the future point of view, is the downswing in new investments. This will curb job and income creations, which, in turn, will further dampen the already muted consumer demand. Most urban consumers are faced with the present reality of wealth erosion and imminent possibility of slower or no income growth. Did your neighbour buy that new car? If he did, he is the odd man out: The automobiles sector has reported negative sales in the Diwali month. Commercial vehicles, two wheelers and passenger car sales, were all down, forcing manufacturers to cut production or shut plants. Though the Finance Minister P. Chidambaram would like companies to cut prices and not production, India Inc. is doing exactly the opposite. On his part, Chidambaram has ensured no let up in government spending (e.g. pump priming) by stating that fiscal deficit isn’t an issue right now. It’s not that there are no silver linings. Reversal in the direction of inflation rate, which should eventually lead to reduction in interest rates, is the most significant positive trend. Remember, the slowdown started earlier this year partly due to the RBI’s obsession with bringing down the then raging inflation. Good monsoons have kept rural incomes growing and investment pipeline— though fast depleting—is still strong. So, where does the net effect of the negative and positive factors leave us? Most economists and forecasts point to worsening economic situation for both producers and consumers in the months to come. But if the global economy doesn’t throw up any new surprises, the positives should get stronger than the negatives from April 2009 onwards— at least for the producers (lower cost of capital and slower wage growth). But the speed of recovery is most likely to be slow and staggered. The International Monetary Fund (IMF), in its November 2008 World Economic Outlook Update observes: “... financial conditions continue to present serious downside risks. The forceful policy responses in many countries have contained the risks of a systemic financial meltdown. Nonetheless, there are many reasons to remain concerned about the potential impact on activity of the financial crisis.” It estimates that the Indian economy will grow at just over 6 per cent in 2009. That is as slow a rate as in 2004-05. And this is the GDP figure. Other growth figures that matter to us more—e.g. salary increments, number of jobs, corporate profits—may not look as good as the GDP. So, conserve your cash for the cold winter ahead and hope for an early spring thaw, so that growth can flourish again.